Reading other blogger's skincare routines is one of my favourite things to do- kind of like peaking into someone else's medicine cabinet. So I've been wanting to share my favourite products with you guys! Plus, the Sephora Sale is on right now. Rouge members had first access to the deals on August 24 with 20% off (code YESROUGE). The VIB members (that's me), can jump into the sale August 30 with a 15% discount (code YESVIB). And Beauty Insiders can claim a 10% discount (code YESINSIDER) Aug 30 as well. Sale continues until September 3rd. I'll be stocking up on some of the products I'm sharing below, that I'm running low on. I recently started using this product, after wandering into Sephora looking for a cleansing balm to use prior to my cleanser. I start my nighttime skincare routine by rubbing this product into my dry skin with my fingers. It reminds me of coconut oil in how it melts from a solid to a liquid. It literally melts away all your makeup, so the next steps of your regimen have a fresh, clean canvas. I rinse off the cleansing balm and my makeup with this super soft 'makeup eraser' cloth and warm water. It takes off every last bit of SPF, oil, and whatever else has collected on my face throughout the day. I use it a few times, then throw it in the wash. I've been using this cleanser for years. I love it because it's effective yet super gentle. It's creamy so not dehydrating. It also removes most makeup. I keep rebuying it and like to go for the giant 24 oz size so I don't have to repurchase often. Plus my husband sneaks it so we go through it quickly. After my face is clean as a whistle, I spritz this toner generously on my face. It's refreshing, soothing, and reduces redness. If you prefer, you can spray it onto a cotton pad and apply it to your skin that way. 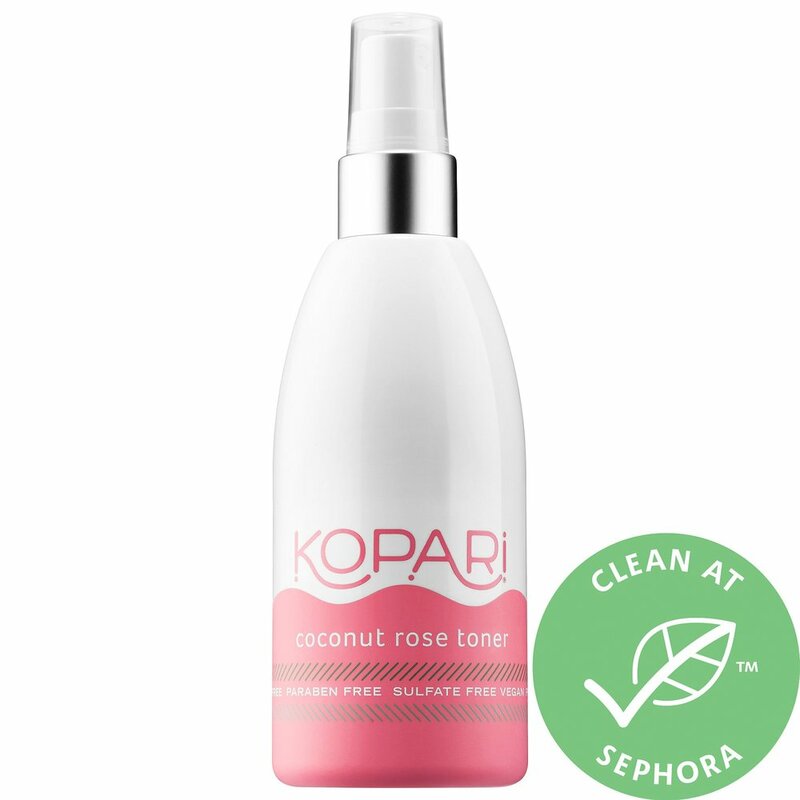 This is the first Kopari brand product I've used but I am looking forward to trying more! This pads are my secret weapon. They have the perfect amount of lactic and glycolic acids to safely and effectively exfoliate, tone, and brighten all skin types, even sensitive skin like mine! Pro -tip: I cut my pads in half so this jar last twice as long! I find the pads to be heavily saturated so half of one is more than enough. Is talking about saturated pads gross?? Sorry. Another product that has been in my medicine cabinet for years, is this eye cream. Be sure to get the 'rich' product versus the original, as I find it more hydrating and that it lasts longer. It is rich and creamy like a balm, so you use less. I also use this product in the mornings. While many other products stay constant in my skincare arsenal, I find I am always switching up my day and night time moisturizers. I recently tried this FAB moisturizer, which I like, it does the job, but I don't find it life changing. I prefer a richer, heavier nighttime cream as my skin is on the normal side versus oily. This cream is a little on the lighter side, so I layer it with the next product... If anyone has a nighttime moisturizer they love, let me know in the comments below! I have a few facial oils I like to incorporate into my nighttime routine, as well as daytime during the winter. This is another product I've used off and on for years, and that my husband likes to use. The rule for products is to apply them in order from lightest to heaviest (serum, moisturizer, then oil). The oil kind of locks all of the other products in. A necessity in my cold Saskatchewan climate! This might be my favourite lip product EVER! I feel like everyone needs to go buy this product now! It is life changing. So hydrating that I put it on before bed and my lips still have product on them when I wake up. And they are super soft, moisturized and plumped. Smooches. There you have it, my current nighttime skincare routine! Are there any products I am missing that I need?? Let me know!